This outfit is entirely Target and Anthropologie. I didn't realize it when I was getting dressed, but I think it is funny that I put an entire look together from two non-JCrew stores. I scooped up this blouse at Anthropologie on Mother's Day and finally got to wear it for the first time this week. It's so hard not find unique, eye-catching pieces at Anthro. I also didn't know I was that much a "neon" person, but it turns out I am. 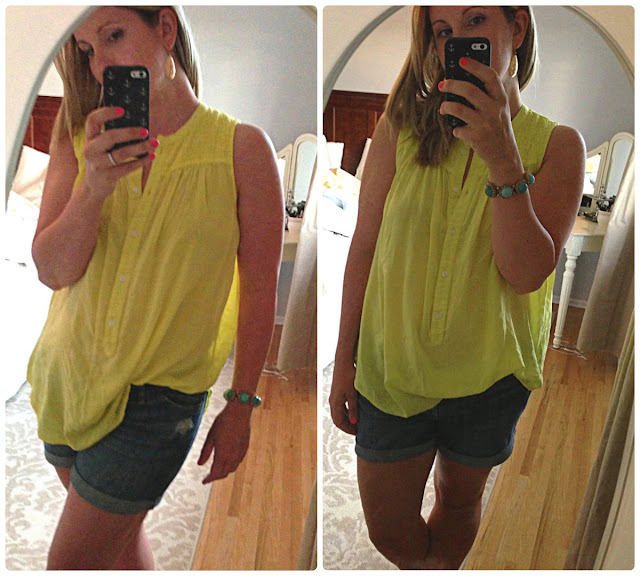 This top was perfect for a long, HOT day playing with the kiddos, cleaning and taking walks. Paired with my trusty maternity shorts (I am NOT pregnant. Just love stretchy waistbands) from Tarzjay and I was comfy all day. I also discovered these sandals in the back of my closet during a recent clean out. They were a spur of the moment Target find last year that I never wore because I hated my post-baby legs so much at the time. They are surprisingly comfortable for inexpensive shoes and also remind me not to buy something just because it is inexpensive - then it gets tossed aside and forgotten! Im loving that top!! Im pretty sure I'm going to spend my whole summer in cut off shorts and sandals! Oh I love your gold rings in your other post!